Historical films, which were once considered unexciting, have now crossed over to mainstream pop culture thanks to the unprecedented success of the movie Heneral Luna. The film has sparked a yearning and curiosity among Filipino film goers for movies with a similarly rich historical and cultural value. Among the films that have gained renewed attention is the 2014 epic "Bonifacio: Ang Unang Pangulo." Bigger, better, and more action-packed, this particular version contains never-before-seen footage and new content delivered by its lead star Robin Padilla.Featuring English subtitles, the local release for the film will also coincide with a US premiere in New York this coming November 30 in time for the celebration of the birth anniversary of Andres Bonifacio. 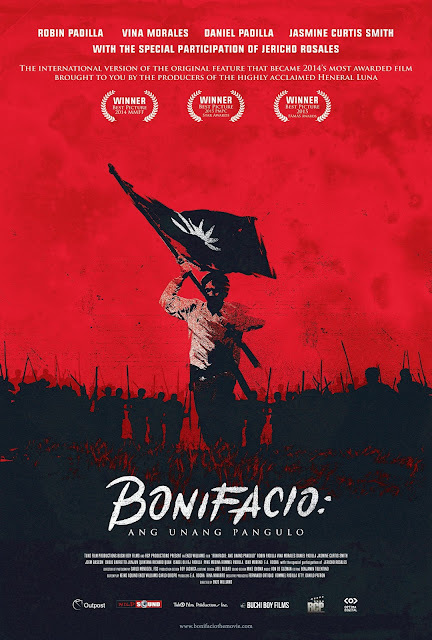 Earlier this year, the producers’ cut of Bonifacio: Ang Unang Pangulo was honored with a standing ovation during its European premiere in Barcelona. Bonifacio: Ang Unang Pangulo Producers’ Cutis produced by Fernando Ortigas for Tuko Films Productions and Eduardo Rocha for Buchi Boy Films. Distributed by Solar Entertainment, the film opens on Wednesday, November 25 in cinemas in SM Megamall, SM North EDSA, SM Manila, SM Fairview, and SM Sta. Mesa.